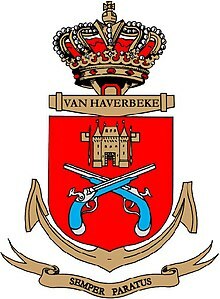 The Belgian Navy, officially the Belgian Maritime Component (Dutch: Marinecomponent; French: Composante marine; German: Marinekomponente[needs IPA]) of the Belgian Armed Forces, formerly the Belgian Naval Force, is the naval service of Belgium. When the country became independent after the Belgian Revolution of 1830, a Dutch squadron blocked the Scheldt estuary. To deal with this threat the Belgian Congress ordered two brigantines to be built, which bore the names Congrès and Les Quatre Journées. 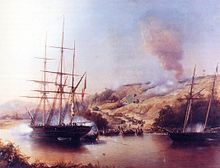 After the French Army, led by Marshal Count Gérard, captured the citadel of Antwerp in 1832, the captured Dutch gun boats were pressed into Belgian service. In 1840 the Belgian government bought the schooner Louise Marie and in 1845 the brig Duc de Brabant. Louise Marie participated in the Rio Nuñez Incident in 1849. In 1862, the Belgian government discarded its navy and pursued a minimalistic naval policy. At the outbreak of World War I, Belgium had no navy (an impromptu force was assembled at the Battle for Lake Tanganyika) but the war caused this policy to change and a Corps of Destroyers and Sailors was created in 1917. The Belgian naval personnel served onboard French minesweepers and provided the artillerymen for Belgian merchant ships. The Treaty of Versailles allocated Belgium 11 torpedo boats and 26 minesweepers. For budgetary reasons, Belgium again abolished its navy in 1927. During World War II many members of the Naval Corps, together with Belgian fishermen and merchant sailors, escaped to Britain with the explicit wish of fighting the German occupiers. The Royal Navy took advantage of this opportunity to enlist the Belgians into separate groups of more or less entirely Belgian-manned ships. From 1940 to 1946, the Belgian Section of the British Royal Navy manned two corvettes, (Buttercup and Godetia), a squadron of MMS minesweepers and three patrol boats (Phrontis [fr], Electra and Kernot). In 1946, Britain donated the ships to Belgium. These vessels became the backbone of the new Belgian Navy. In the beginning of the nineties, the end of the Cold War caused the Belgian government to restructure the Belgian Armed Forces in order to cope with the changed threats. This led to a reduction in the size of the Armed Forces. With regards to the Belgian navy, these cutbacks meant that one Wielingen-class frigate was taken out of service and that three Tripartite-class minehunters were sold to France. In 2002, the government decided to impose a "single structure" on the armed forces in which the independent Belgian Marine Royale ceased to exist. The former Navy became the Belgian Naval Component (COMOPSNAV) of the Armed Forces; it is also called the Marine. On 20 July 2005, the Belgian government decided to buy two of the remaining six Dutch M-class frigates to replace the two remaining frigates of the Wielingen class (Wielingen and Westdiep) currently still in service with the Belgian Navy, which in turn might be sold to Bulgaria. On 21 December 2005, the Dutch government sold Karel Doorman (F827) and Willem Van Der Zaan (F829) to Belgium. The two ships were sold for about 250 million Euros. These two M-class frigates entered service with the Belgian Navy where they were renamed Leopold I and Louise-Marie. In October 2005, the Wielingen-class frigate Wandelaar was officially handed over to the Bulgarian Navy, which christened the ship as Drăzki ('The Bolds'). The remaining ships of the class were transferred to Bulgaria as well, after completing modernization in Belgium. A Tripartite-class minehunter, Myosotis, which was renamed Tsibar was transferred to Bulgaria soon after. The current Commander of the Maritime Component is Divisional Admiral Wim Robberecht (since 2016). A958 Zenobe Gramme, (1961–) Sailing Ship used for training and representation purposes. In 2012–2015 the two Belgian Navy frigates were upgraded, followed by the two frigates of the Dutch Navy. In 2013 the first NH-90 Helicopter was delivered and introduced into service replacing the Westland Sea King and Alouette III from 2014 onwards. In the strategic defence vision report of the Belgian government, it was stated that by 2030 the Belgian naval component will have invested in two new frigates and six new minehunters. The Belgian Navy and Royal Netherlands Navy will replace their M-class frigates with the Future Surface Combatant. In March 2019 the Belgian Navy and Royal Netherlands Navy announced that they will replace their Tripartite-class minehunters with six new minehunters each to be built by a consortium led by France's Naval Group. ^ "La Défense" (in French). Archived from the original on 1 April 2016. Retrieved 25 March 2016. ^ "Defensie" (in Dutch). Archived from the original on 20 March 2016. Retrieved 25 March 2016. ^ Pike, John. "Belgium - Navy / Composante Maritime / Marinecomponent". globalsecurity.org. Archived from the original on 5 December 2017. Retrieved 7 May 2018. ^ "Dunkerque". KLM-MRA Séction Marine. Archived from the original on 2 October 2013. Retrieved 28 September 2013. ^ "Un chantier naval français construit les nouveaux patrouilleurs de la Marine". 5 February 2013. www.mil.be. Archived from the original on 7 April 2013. Retrieved 7 February 2013. ^ "Nieuwe Commandant voor de Marine". mil.be. 15 September 2016. Archived from the original on 1 December 2017. Retrieved 7 May 2018. ^ "Akkoord over het strategisch plan voor Defensie 2030" (in Dutch). 22 December 2015. Archived from the original on 18 August 2016. Retrieved 21 August 2016. ^ "Vervanging van het oceanografisch onderzoeksschip Belgica | Presscenter.org". www.presscenter.org (in Dutch). Archived from the original on 30 December 2017. Retrieved 30 December 2017. ^ Fiorenza, Nicholas (29 May 2018). "Belgium approves M-frigate replacement". www.janes.com. Archived from the original on 29 May 2018. Retrieved 29 May 2018. Wikimedia Commons has media related to Navy of Belgium.